Specials Jamie posting the fastest qualifying time from 11 races on night-one of the Remington Park Futurity trials. OKLAHOMA CITY, OK�APRIL 4, 2014�The first 11 trials are in the books as Friday night qualifying for the Remington Park Futurity(RG3) ended with Specials Jamie with the top time among five qualifiers. The filly crossed the finish in :16.583 seconds for 330 yards over a fast track in the fourth trial of the evening. The Remington Park Futurity trials, a total of 22 over two nights, will determine the final field of 10 for the lucrative April 19 final. The fastest five from tonight will join five from Saturday night in the $791,000 event for Oklahoma-bred 2-years-olds. Overall, the entire program for the Remington Park Futurity and Remington Park Derby is worth more than $1.8 million this year. Owned and bred by A.C. Taylor of Seminole, Okla., Specials Jamie broke well from her rail postposition under jockey Agustin Silva. The Kasey Willis-trainee encountered contact when rivals from the middle of the gate collapsed to the inside, placing a bump into Specials Jamie. The filly had enough power generated by that time to come away from the incident and still fly home three-quarters of a length in front of Beneteau, earning a 97 speed index. AJs High was another head behind in third as the top three finishers from the fourth trial all advanced to the final. The win was the first from two starts for Specials Jamie, a daughter of IVORY JAMES from the Make It Anywhere mare Special Anywhere. For list of the five Remington Park qualifiers from night-one, their times, sires, dams, owners, breeders, trainers and jockeys CLICK HERE. Willis and Agustin teamed up for three wins on the Friday night card, also scoring with Days Gone Down ($7.60 to win) in the third trial and Coronas Miss Perry ($3.40) in trial nine. 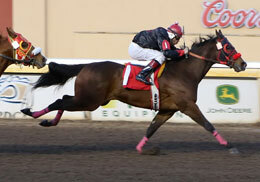 Only Specials Jamie will represent the trio of Willis-Agustin winners in the Remington Park Futurity. The final 11 Remington Park Futurity trials will be conducted Saturday night with the first race on the program at 6pm.